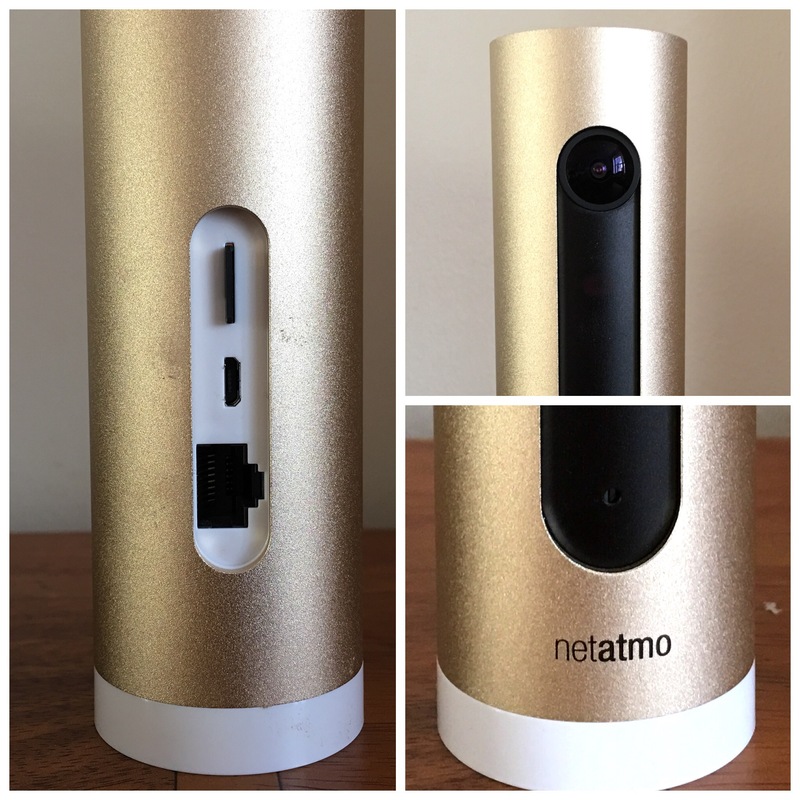 Welcome to my review of the Netatmo Welcome Indoor Camera. 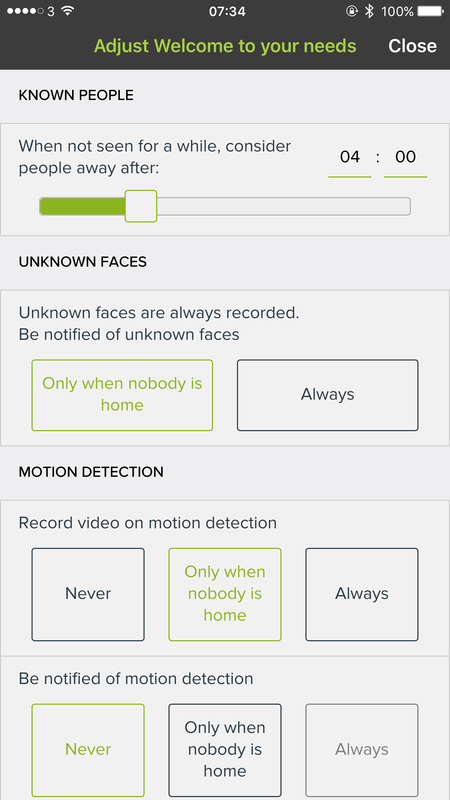 The Netatmo Welcome Indoor camera unique selling point is its ability to recognise faces and then send you notifications to your phone. See video from Netatmo below showing this in action. – Build – Single piece of durable aluminium shell, Matte black plastic piece infrared transparent. – Hardware Requirements – High-speed Internet connection needed, Public hotspots not supported. – Monthly Costs – Nil, Free to Use, App available on the App Store / Google Play.Free access to your camera online. 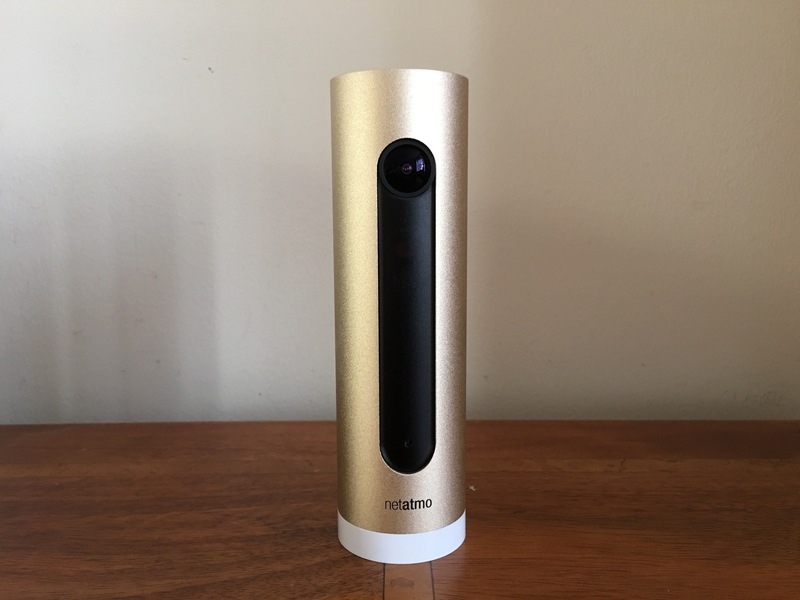 The Netatmo Welcome camera is a lovely piece of hardware and doesn’t look like a typical camera. This means it gets blended into your environment without people gets paranoid they are being “watched”. In fact, you forget its actually there. On the rear there is an ethernet port, micro SD card slot and micro USB port. The front is minimalistic. Notes – I originally reviewed this after 3 weeks. Further down is my update after 4 months following a significant firmware update that added lots of new features which are documented along with a tip if you have dogs. I have been using the Netatmo Welcome for 3 weeks now and overall have been pleased with its operation and results and intend to keep this indefinitely as my home connected security indoor camera. I also have several IP Cameras which were a total nightmare to setup and configure as remote access involved changing my home router configuration. I have now retired these. In terms of other connected devices, I have a Netatmo Urban Weather station which is coming up to 2 years old and a range of lights that are controlled from my iPhone and or Apple Watch. Due to protecting my own privacy, screen shots of the app in operation have been edited to remove views of my home. Netatmo have made the first setup as simply as possible. I setup my Netatmo Welcome camera using my iPhone 6S Plus. I downloaded the Netatmo Welcome app from the Apple App Store and then followed the on screen setup instructions provided by the app. The app asks permissions to share Wi-Fi setup from your iPhone to the Welcome camera and literally within 5 minutes the camera is connected. Points to note. The Welcome camera only operates at 2.4G . Over the next 24 hours a new firmware arrived and got installed on the camera and the app showed me faces and asked me to identify who the respective people were. For each member of your house, a face profile gets created. The concept of the Netatmo Welcome camera is simple. It learns all the faces of people who live in your home/flat and then notifies you when somebody comes home and tells you who they are and also if somebody arrives who is not recognised. When movement is detected, it records a clip onto the micro SD card which can be streamed back on to your phone and or downloaded remotely to your phone as well. When at home you can also play back the recorded video clips. Other options include a range of privacy and advanced security options. For example if your Netatmo password gets changed, or someone logs into your account you can receive an email. Netatmo will also block your account if there are too many failed attempts occur. In terms of learning faces, you can go into the app settings and speed up the learning process. You can also tell the system when the house is empty and adjust other settings as shown below. Using the app on your phone is really easy. It shows a live view snapshot when you open the app. You can then hit the play icon to stream live video. Turning your phone landscape provides full screen playback and streaming. Scrolling the screen reveals details of who is at home and or when they were last seen. Scrolling the screen the other way reveals a list of when movement was detected. Tap on one notifications and you can watch or download the recorded movement. Now if your home is broken into and someone steals your camera, you will get a notification that Welcome was switched off. The person cannot access your data and videos without your Netatmo account details. However, this also means if the camera is never recovered, you cannot view the videos stored on the camera either. 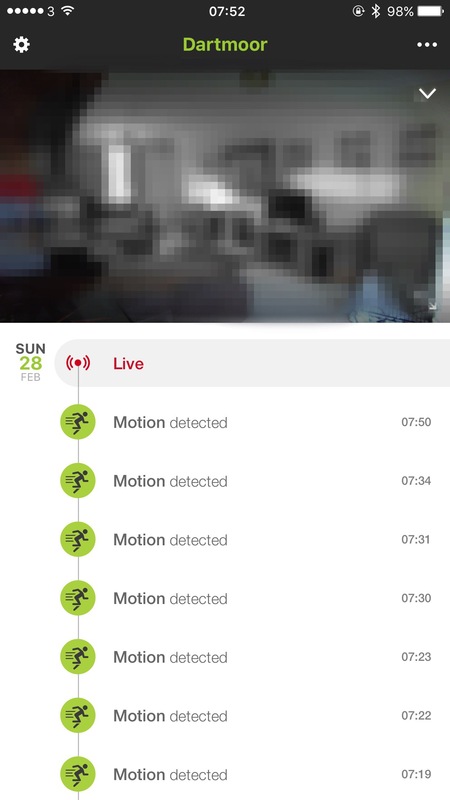 However, if you sign into My Netatmo on the web you will be able to see a screen shot of each video before it started the recording of the motion. The video quality is excellent and the camera switches to night mode which provides clear images and video as well. As I have mentioned I have had the Netatmo Welcome indoor camera for 3 weeks now. In that time, the camera has come offline about 4 times for no apparent reasons and then reconnected a few hours later. I don’t know if its my broadband dropping although that wouldn’t surprise me as the connection does vanish occasionally. I have only had to pull the power cord out and replug back in to restart the camera just once when it became unresponsive. In terms of recognising faces this is now 90% accurate. I have relocated the camera several times to get a better position. To be honest, positioning is crucial. If the camera is recording motion to the micro SD card, it is not possible to see a live view until this has finished. UPDATE – 4 months later, Netatmo released a major firmware update. This improved its performance and reliability but also added Dropbox support and tags. With Dropbox you can now upload video clips to the cloud instead of using the micro SD card. Tags are waterproof sensors for doors and windows. Photo above is one of my tags. The Netatmo tags are superb as they detect the motion before the intrusion occurs. That is because they detect vibrations. The Tags’ have an integrated open/closed state sensor, so you can choose to be alerted if you have accidentally left a window or the garage door open. And then you can check directly on your smartphone if all windows are closed. Tips – I have 3 labradors and the Welcome camera was recognising my dogs faces. So instead of telling the Welcome camera they were not faces, I did the opposite. So now it recognises my 3 labradors and that means I don’t get any false notifications about an unknown face. 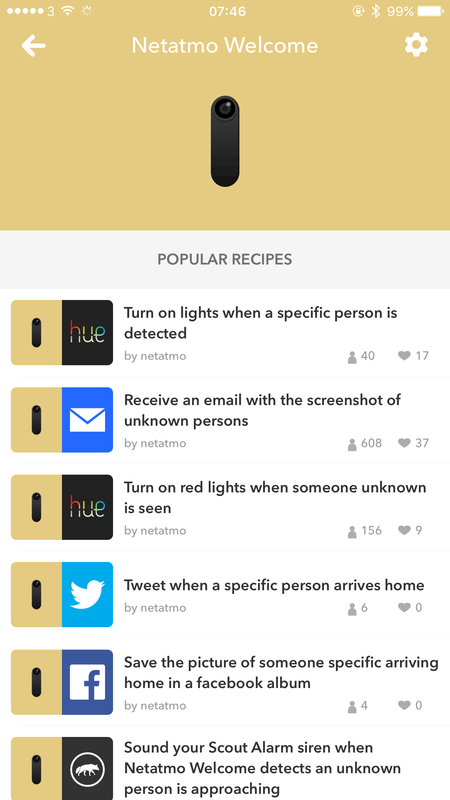 The Netatmo Welcome camera supports third apps and that extends to IFTTT. This opens up a whole world of different sequences that can be achieved. See screen shot below. You can also add Welcome tags to the system, sensors for doors and windows. The other aspect I like about the Netatmo Welcome Indoor camera is once bought, there are no other costs. Its free and it has no monthly charges either. As I mentioned already, Netatmo allow you to sign into to your camera via a web browser which uses their web app. Using a web browser, if you have other Netatmo products, you can access all the different connected devices in one go. The Netatmo Welcome Indoor camera recommended retail price is £199, although if you click the link below it is available for a lot less. It provides piece of mind with its face recognition and notifications with zero ongoing costs once purchased. Add to the fact it supports third party app integration and it becomes a decent investment. It also doesn’t look like a typical camera so blends into the home environment. And now after using it for over 4 months the added new features of tags and Dropbox integration really add to its value. Great info there, thanks Gavin. I have been thinking of getting into Home Security systems so any information is good information. I am not bothered about notifications of who comes home as there are only my wife and myself and to the most of our time we don’t lead independent lives (thank you retirement). I am more concerned with being notified when we are away of someone approaching the door, delivering packages etc. etc. For the time being I have just this week installed the app ‘Manythings’ which turns an unwanted or not used iOS device into an wifi camera. 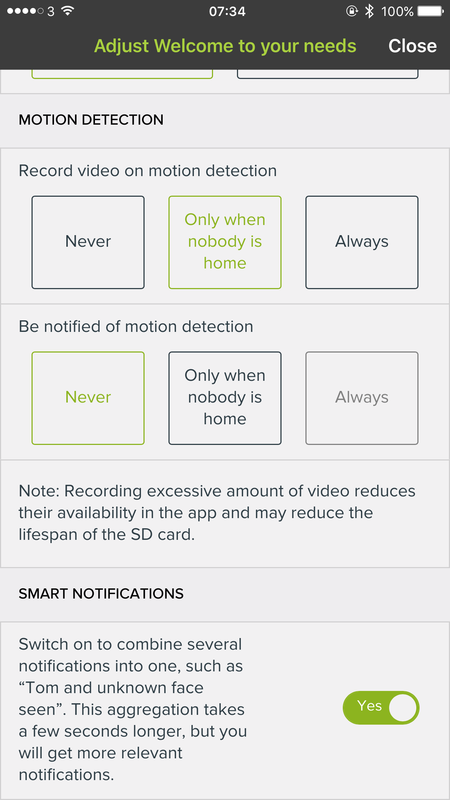 What I like about the app is it can be started by motion sensor saving many small clips like the Netatmo but more importantly once you have the screen in the right place you then select out areas that you do not want the motion detector to look at. Clips are sent to the cloud and is free for the first camera supporting up to 5 cameras which are then at a cost. So Gavin, Manythings has a short term employment whilst I decide on what system to use. Hive is the latest I am looking at which has door/window sensors and a motion camera. There’s also bulbs, sockets and the central heating/hot water control. Each system seems to have their strengths and weaknesses. Lastly I am interested in which of the IP cameras you tried that were problematic and no longer in use ~ these are the ones I don’t want to waste time or money pursuing. Mike. The IP cameras I have used were cheap nasty chinese type that weren’t part of a special setup etc… They were £30 cameras that required extensive technical knowledge and a PITA. They worked but don’t offer any of the slickness. I did use a slightly better Chinese brand Tenvis, but again you need some technical know how. TBH there isn’t an all in one that is perfect. When Apple’s Home Kit becomes more prevalent then we might see some better integration with other apps and services. The Netatmo Welcome is quite good TBH for what I need. BTW I got a replacement wind sensor about 3 weeks ago from Netatmo and so far its been perfect i.e. not false readings. Ahh… Yes you’re right, there’s a big difference from a cheap £30 IP Camera to one such as a BT Smarthome 100 which costs around £80. I’ll continue trying Manythings until I get a much clearer picture. Good to hear the Wind sensor is working well.